Our team of specialized garage door maintenance technicians understands the importance of maintaining the health, safety, and security of your doors at home. 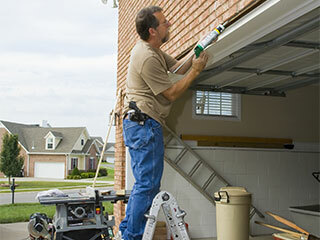 Our services are designed to extend the life and functionality of your garage door and opener. We can provide minor repairs on broken parts, will perform safety tests to ensure that your door isn’t a danger to anyone in your family, and will, of course, replace worn-down parts whenever the need arises. So, give us a call today to find out more about our maintenance services that will keep your doors in top condition, for longer. Many of the components in your automated garage door are subject to a limited lifespan. As they are used they begin to wear down, lose structural integrity and will malfunction over time. Our maintenance team is here to provide you with garage door spring replacements, as well as for safety cables, tracks, panels and any other components which have taken damage for any reason. Many of the safety features on your doors may take damage over time, often without you even noticing it. When this happens, it can render your garage door dangerous to operate, which makes staying on top of the condition of safety features a priority for any owner. Let our team inspect the reverse mechanism, the condition of the springs and cables, and the photo-eye sensors to make sure your door is safe to use. Many of the parts in your door will become worn down through extensive use, eventually undermining the performance of your door. To ensure that your door operates in peak condition, have one of our maintenance specialists replace garage door bearings, tracks, trolleys, and cables for you. For further information on our various garage door repair services, contact Garage Door Repair New Hope today and speak to us for details on our various maintenance services. We are waiting for your call.